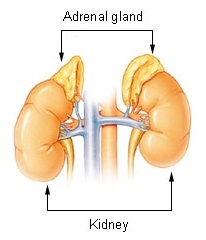 The adrenal glands lie abuin the kidneys. 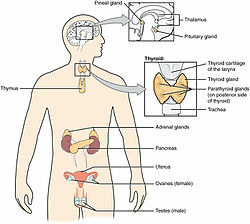 The adrenal glands (an aa kent as suprarenal glands) are endocrine glands that produce a variety o hormones includin adrenaline an the steroids aldosterone an cortisol. ↑ "Adrenal gland". Medline Plus/Merriam-Webster Dictionary. Retrieved 11 February 2015. This page wis last eeditit on 21 November 2015, at 17:06.